I first spotted the tracks as our chartered bush plane circled to land in the snow-covered foothills of the Brooks Range. Polar bears. On day two a wolverine ran in front of us at the far edge of the frozen riverbank. On day three we climbed for ten hours to reach the summit of a mountain; there we gazed fifty miles north to the Arctic Ocean before skiing through the crevasses of a glacier that will likely have melted away less than one hundred years from now. On day four a snowstorm immersed me in a wild silence unlike any I’d ever experienced. On days five and six we skied southward, deeper into the mountains. We followed the solo tracks a wolf had laid just hours ahead of us, and I wondered if I belonged there enough to ski over them? On day seven we climbed another ten hours to the top of Mount Isto, the highest mountain in the Brooks Range, amid the calm evening light. From this place it came to me: for now, in all directions there is endless and pure wilderness with not a sight, sound, or bit of tension from human development. My wish is that a place as rare as this continues to exist. 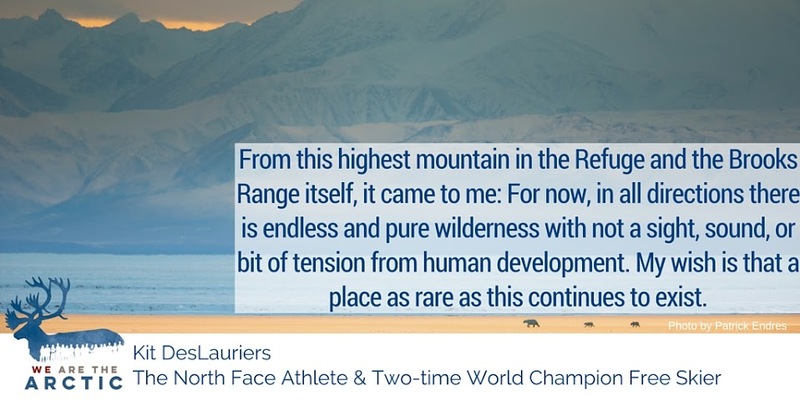 Two-time world champion freeskier and ski mountaineer Kit DesLauriers (The North Face) is the first person to have skied off of each of the Seven Summits. During a 2010 expedition to the Arctic National Wildlife Refuge, Kit skied the highest mountain in the Brooks Range and then sixty miles north to the Beaufort Sea.